KUWAIT: The Capital Markets Authority (CMA) highlighted some of its achievements in various fields in the past few years at its fourth annual conference titled “Capital Market Reforms Through Regional Initiatives” held at the Jumeirah Messilah Hotel and Spa yesterday. The conference was attended by a number of local, regional and international experts. “CMA’s achievements include upgrading the stock market with various indexes such as FTSE index, S&P index, DJI index and MSCI index. Also, having all these international experts coming from abroad to participate in this conference is a great addition to Kuwait,” said Minister of Commerce and Industry Khaled Al-Roudhan. “We in the government respect the independence of CMA and we support their work. This has economic and commercial reflections that affect the economic situation in general. We have witnessed great success at the Kuwait stock exchange which has received a huge foreign money flow, and we aim to improve this market even more,” added Roudhan. Othman Al-Issa, Vice Chairman of CMA Board of Commissioners, opened the conference with a speech in which he pointed to the importance of “securing and developing financial markets” and enabling them to possess the necessary elements to cope with the rapid changes in capital markets and keep pace with the latest developments in the field of securities. Issa stressed the importance of three topics which represent some of the current trends in the development of capital markets. “The first topic is incentives and initiatives to promote listings across the Middle East and Africa region, the most important recommendations and what has been achieved locally in this area. The second is SME financing, its mechanisms and methods, the limitations and challenges facing it, and the role that this financing can play in the national economy. The last topic is regional responses to emerging fintech risks and the limitations and challenges facing it locally, regionally and globally,” he pointed out. He also spoke about the most important strategic approaches of the CMA for the development of the capital market currently being implemented. “These include privatization of the securities exchange, the market development project and other initiatives related to the development of capital market infrastructure such as clearance and settlement, as well as initiatives to stimulate qualitative listing and long-term financing mechanisms, establish effective sukuk and bond trading platforms, diversify investment instruments and improve the level of risk management of licensed persons as well as the disclosure system by adopting a modern project in the field of disclosure using the language of XBRL,” explained Issa. The conference had three panels focused on three main issues. The first panel was on “Incentives and Initiatives to Promote Listings across Africa and the Middle East Region.” The implications of such recommendations and their impact were discussed, along with other recommendations. The panel was chaired by Keith Kalyegira, CEO, CMA Uganda, with the participation of Noura Abdulkareem, Director of Product Development at Kuwait Boursa and Mohammed Alrumaih, Chief of Markets of the Saudi stock exchange (Tadawul). Dr Nawaf Al-Abduljader, Assistant Professor at the Faculty of Administrative Sciences, Kuwait University, headed the second panel discussion, with the participation of Ibrahim Al-Kandari, Director General Kuwait National Fund for SME Enterprise Development, and Daniel Tetteh, Director General, SEC Ghana, who reviewed the mechanisms and means by which the financing of the SME sector can be supported, as well as the experience of the National Fund for the Development of Small and Medium Enterprises in Kuwait and its role in national economy. The panel also highlighted challenges faced by them. Tetteh reviewed his country’s experience in improving support for small and large enterprises and the most important actions taken in this framework. The conference concluded with a panel headed by Phillippe Richard, Director Abu Dhabi Global Markets FSRA, with the participation of Paul Muthaura, Chief Executive (CMA Kenya) and Joe McHale, Regulatory Affairs Specialist at Bloomberg, in addition to Dr Bander Alsajjan, Strategy and International Affairs Deputy (CMA Saudi Arabia). The panel was on “Regional Responses to Emerging FinTech Risks” with the emergence of encrypted assets, automated learning and artificial intelligence, and the efforts of regulators to keep up with such developments. The Bloomberg representative presented a clear vision of the trends, growth and development prospects of financial technology, while the representatives of Abu Dhabi International Market, the Saudi Capital Market Authority and the Capital Market Authority of Kenya presented what was accomplished in their countries in keeping pace with the development of financial technology either through the issuance of new legislation or the development of innovation hubs or sandboxes, or other initiatives that have been implemented within this framework. The fourth annual conference of CMA has received special importance for several reasons. It follows an exceptional event which takes place in Kuwait for the first time, which is hosting the meetings of one of IOSCO’s committees. This is considered a major milestone in the course of local securities activities, in which exceptional achievements have been made and the work of strategic initiatives on the other hand has begun. 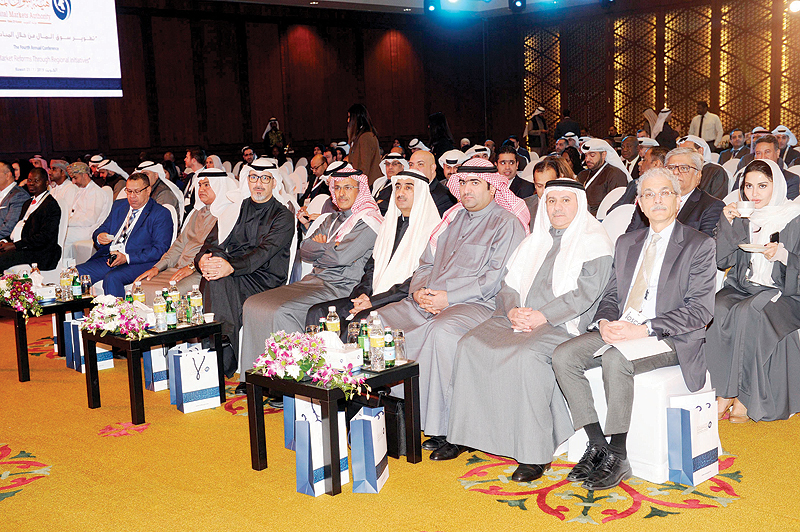 On Tuesday, the 42nd annual meeting of AMERC was held in Kuwait as the first of its kind. Othman I Alissa stressed Kuwait’s keenness to activate its role in the various committees of IOSCO after obtaining membership in AMERC. Currently, in addition to AMERC, the CMA is a member of the GEMC, C2 and C3 committees. The main topics of the meeting, the deliberations and discussions on the subject of sustainability financing, the opportunities and risks arising from fintech and supporting economic growth through long term finance were highlighted by Muthaura in his opening remarks. Such topics “not only cut across the priorities of the region, growth and emerging markets, but also the priorities of the whole organization under the leadership of the board”, he said.